Baby teeth are the first set of teeth that becomes visible in the mouth of a child. They are also known as deciduous or primary or milk teeth. Normally, they start to develop during the embryonic stage and erupt during infancy. The primary teeth begins to develop at the sixth week and it starts at the midline and from there extends to the posterior region. By the age of 8 weeks, ten buds appear both in the upper and lower arches. It is through these that the primary dentition will become visible. The appearance or eruption of these teeth starts at the age of six months and extend to between twenty-five and thirty-three months of age. The first set of teeth visible in the mouth are the mandibullar centrals and the last to appear are the maxillary second mollars. The primary dentition consist of 20 teeth which are numbered from 1 to 20 followed by a small letter ‘d ‘ to indicate that they are baby teeth. In the universal numbering system, primary teeth are represented by letters instead of numbers. The primary teeth are indicated by upper case letters starting from’ A ‘to ‘T’. ‘A’ is the upper right second primary molar and ‘T’ is the lower right second primary molar. 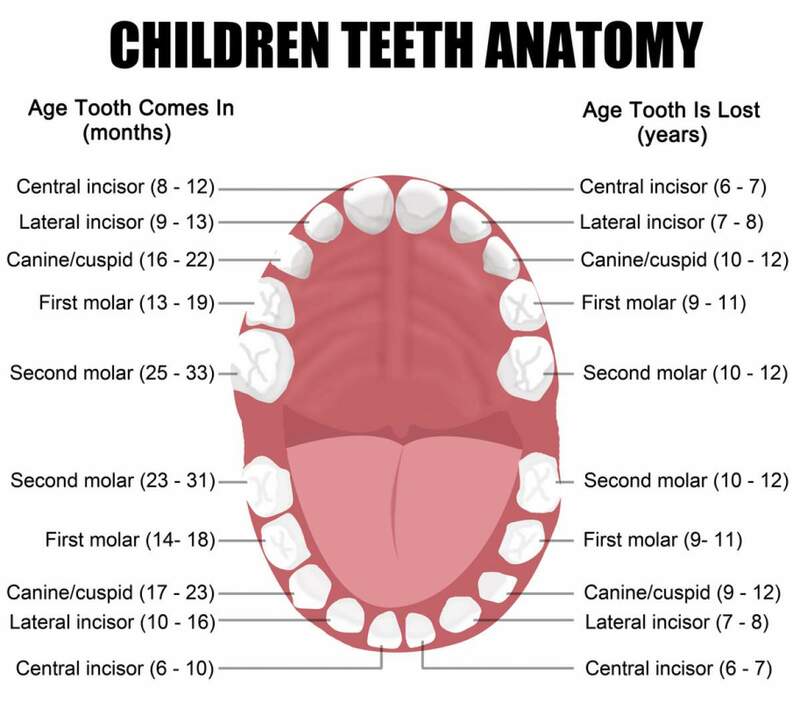 As in the case of the adult teeth, baby teeth are also ordered in the mouth, also there is eruption order of the primary teeth. The primary dentition is made of 20 teeth. Each quadrant consist of five teeth and each arch has ten teeth. They are made up of central incissors, lateral incissors, canines, first molars and secondary molars. Each of these is present in each quadrant. There are 8 primary incisors, 4 primary canines and 8 primary molars. The general guiding rules for milk teeth eruption order are: that 4 teeth will erupt every 6 months of life; that primary teeth erupt early in girls than boys; and that lower teeth erupt before upper teeth. There is usually eruption of teeth in pairs in both lower and upper jaws. Unlike permanent teeth, primary teeth are small in size and whiter. They have smaller and narrower roots and they are less strong than the permanent teeth because they have less mineral in the enamel. They have no premolars. Read more about order of baby teeth in this article. Baby teeth are of various sizes, shapes and the places they occupy in the mouth. These variations enable the teeth to perform their functions of speaking,chewing and smiling effectively. In the upper jaw, there are central incisor, the lateral incisor, the canine(cuspid), the first molar and the second molar. In the lower jaw there are second molar, first molar, canine(cuspid),lateral incisor and the central incisor. In the upper jaw starting from the midline is the central incisor, followed by lateral incisor, canine (cuspid) first molar and second molar, the same applies to the other quadrant in the upper jaw. In the lower jaw starting from the midline are central incisor, lateral incisor, canine (cuspid), first molar and second molar in that order, the same applies to the second quadrant in the lower jaw. After all the baby teeth might have fallen out and the permanent teeth grow to replace them, the holes left by the baby milk are filled. In toher words, after the growth of the adult teeth, there are no longer holes left as a result of the growth of the maxilla and mandible. To some people seeing the picture of baby skull when the primary teeth are falling is unpleasant and scary, although every adult person passed through the stage. However, seeing or studying the skull when the primary teeth are naturally being removed is educative, because it shows what actually takes place in the process of replacing them with adult or permanent teeth. Just as there is baby teeth eruption schedule, there is also baby teeth loss schedule. It is perfectly normal that the milk or primary teeth give way to the permanent teeth. The primary teeth fall out without necessarily following any particular order, although it is probable that the teeth that appeared first are the ones that are likely to fall out early. In this wise, the middle teeth can fall out first when the child reaches between the age of 6 and 7 years. The teeth on the either side can follow suit between age 7 and 8 years. The molars are the next to fall out probably before or between age 9 and 12 years.